(Nanowerk News) Converting sunlight to electricity might no longer mean large panels of photovoltaic cells atop flat surfaces like roofs. Using zinc oxide nanostructures grown on optical fibers and coated with dye-sensitized solar cell materials, researchers at the Georgia Institute of Technology have developed a new type of three-dimensional photovoltaic system. The approach could allow PV systems to be hidden from view and located away from traditional locations such as rooftops. Details of the research were published in the early view of the journal Angewandte Chemie International on October 22. The work was sponsored by the Defense Advanced Research Projects Agency (DARPA), the KAUST Global Research Partnership and the National Science Foundation (NSF). 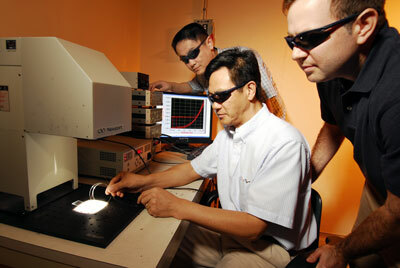 Georgia Tech researchers Yaguang Wei, Zhong Lin Wang and Benjamin Weintraub (left-right) examine a prototype of their three-dimensional solar cell based on optical fiber. Dye-sensitized solar cells use a photochemical system to generate electricity. They are inexpensive to manufacture, flexible and mechanically robust, but their tradeoff for lower cost is conversion efficiency lower than that of silicon-based cells. But using nanostructure arrays to increase the surface area available to convert light could help reduce the efficiency disadvantage, while giving architects and designers new options for incorporating PV into buildings, vehicles and even military equipment. Fabrication of the new Georgia Tech PV system begins with optical fiber of the type used by the telecommunications industry to transport data. First, the researchers remove the cladding layer, then apply a conductive coating to the surface of the fiber before seeding the surface with zinc oxide. Next, they use established solution-based techniques to grow aligned zinc oxide nanowires around the fiber much like the bristles of a bottle brush. The nanowires are then coated with the dye-sensitized materials that convert light to electricity. Sunlight entering the optical fiber passes into the nanowires, where it interacts with the dye molecules to produce electrical current. A liquid electrolyte between the nanowires collects the electrical charges. The result is a hybrid nanowire/optical fiber system that can be up to six times as efficient as planar zinc oxide cells with the same surface area. Wang and his research team have reached an efficiency of 3.3 percent and hope to reach 7 to 8 percent after surface modification. While lower than silicon solar cells, this efficiency would be useful for practical energy harvesting. If they can do that, the potentially lower cost of their approach could make it attractive for many applications. By providing a larger area for gathering light, the technique would maximize the amount of energy produced from strong sunlight, as well as generate respectable power levels even in weak light. The amount of light entering the optical fiber could be increased by using lenses to focus the incoming light, and the fiber-based solar cell has a very high saturation intensity, Wang said. Wang believes this new structure will offer architects and product designers an alternative PV format for incorporating into other applications. Traditional quartz optical fiber has been used so far, but Wang would like to use less expensive polymer fiber to reduce the cost. He is also considering other improvements, such as a better method for collecting the charges and a titanium oxide surface coating that could further boost efficiency. Though it could be used for large PV systems, Wang doesn’t expect his solar cells to replace silicon devices any time soon. But he does believe they will broaden the potential applications for photovoltaic energy.